If you’re wondering how to protect your sofa from stains, you've come to the right place. Sofas have a tendency to get funky, fast. Whether you have children, pets, or just can’t be trusted with a glass of red wine, the sofa seems like the one place where dirt and stains accumulate before anywhere else. I have two children under the age of 5, which means my sofas acquire their fair share of gunk. Just yesterday, I found random fruit snacks, cereal, and pieces of a chocolate granola bar lodged between the couch cushions — and we don’t even allow food in the living room! Then again, I’ve also been guilty of spilling coffee on the arm of my beige couch. All of these couch-killers beg the question: How do you care for your sofa? First, look at your couch care instructions (these should be on a tag under the cushions or attached to the couch body itself) and use these as the guidelines for the care you provide. Some couch fabrics allow water (W) and other solvent-based cleaners (S), while others can only handle a swift vacuum session (X). Surprisingly, there are a number of ways to tackle sofa treatment, including both preventative and reactionary measures. If you’re eager to learn how to protect your sofa from stains, follow these four tips. It’s nearly impossible to figure out how to keep a fabric sofa clean, so the best place to start is to prevent stubborn stains on your fabric in the first place. Stain resistors work to block your fabric from pesky stain makers like crayons, dirt, food, and beverages. Use a specially formulated spray such as Scotchgard Fabric and Upholstery Protector or another brand of fabric protector spray. This liquid acts as a barrier between your fabric and anything else that touches it. Don’t worry, a fabric protection spray doesn’t change the look or feel of your sofa, but it does work! Stubborn spots sometimes require a bit more than a quick scrub to remove all evidence of a stain. Start your spot sofa treatment by adding steam to the stain, which helps to lift it from the fabric. I use my iron, set on the “steam” setting” but an actual steamer will also do the trick. After a proper steaming session, use a combination of white distilled vinegar and baking soda (the best cleaning combination known to man!) Place this combination directly on a clean, white rag and scrub the stain thoroughly. Allow it to sit until the mixture dries, which can be anywhere from 30 minutes to an hour. Then, use a vacuum over the spot where the stain once was to remove any lasting residue of baking soda. While baking soda and vinegar are remarkably effective at removing most stains, sometimes a few drops of clear dishwashing liquid helps boost the stain-lifting power. LIfe gets busy, but it’s important to carve out one morning or afternoon every month for proper couch care. During this time, give the couch a solid look-over, noting any major stains or pulls in the fabric. 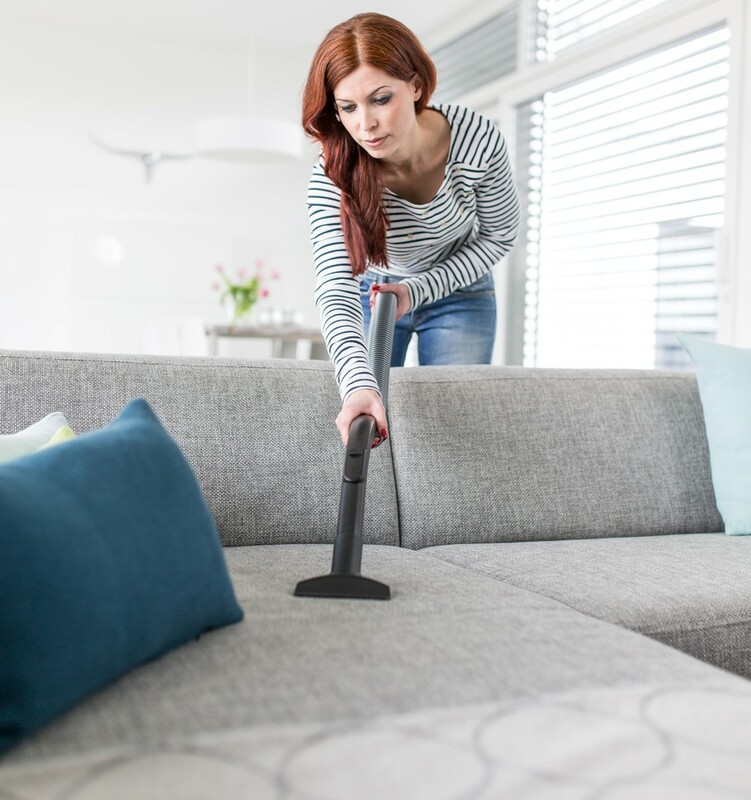 Then, using the brush or fabric attachment for your vacuum, slowly and carefully run the attachment over the entire couch or sofa. Remove all the cushions and pillow to ensure you reach every nook and cranny. Don’t forget to fluff the cushions and pillows before you put them back. To ensure your couch cushion wear evenly, flip them for good measure. Then, pay close attention to your couch fabric at all times. If there’s a stain, tackle it immediately. Avoid allowing clumsy little ones to eat food on your couch (if you can help it) and, whenever possible, avoid allowing direct sunlight to hit your fabric or else it may fade prematurely. How do you deep clean a couch? You have two options. First, you can hire a professional. This will cost anywhere from $10 to $250+ depending on the size of your couch. Look for companies with good reviews and experience in your area. You can also attempt to deep clean your couch yourself using baking soda. It’s easy, convenient and just as effective. Sprinkle baking soda around your entire couch and allow it to sit for up to an hour. Then, run your vacuum across the entire area. If you want, follow this up by using a carpet/fabric cleaner. You can rent a machine from any home improvement store or use your own. They retail for $60 to $300, depending on the make and model. Remember, washing sofa cushions in the washing machine is never a good idea unless the care instructions indicate you can. The spin cycle can wreak havoc on the delicate couch fabric, creating pills and stretching the fibers. Always check the care instructions for your fabric before getting started. If a stain simply won’t lift, consult a professional. With a little love and care, you can keep the fabric on your sofa or couches looking brand new.